Everybody knows red onions, especially if you cook your own meals. 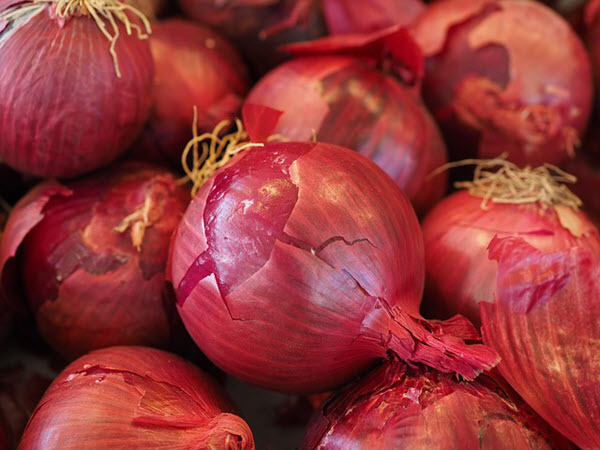 These reddish bulbs are part of the Allium family that has a very strong, distinct flavor. If you want to know how to grow red onions so you can harvest them from your own garden, you're in luck. They're considered to be very easy to grow from home as they require very little cultivation, and you can grow them in pots. Our simple step-by-step guide will tell you exactly how to grow red onions so you can enjoy all of the benefits of eating this vegetable year round. Generally, these plants need a specific climate and a specific soil type to thrive. 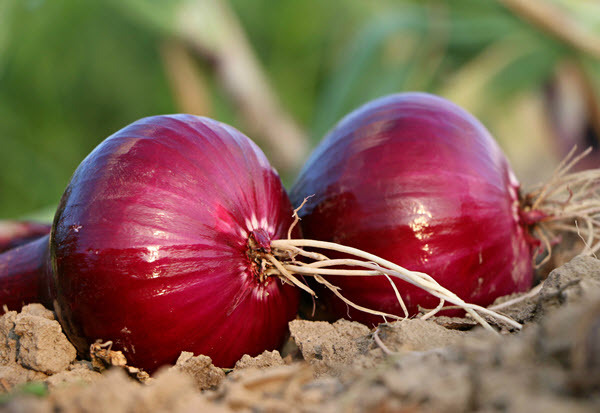 However, you can find all types of onions suited to all climate and soil types. They love sunlight, so you'll need to ensure that you plant them in a spot that gets a lot of sunlight throughout the day. They grow in just about any kind of soil except dense clay. You can also add fertilizer to give them a nutrient boost for larger growth. Start getting your onion's growing patch ready by loosening the soil with your hard rake. Remove all of the rocks and stray weeds after you've loosened the soil. Mix in a half or a full of a bag of compost into the loosened soil patch to allow your onions to get a good head start. Loosen the soil with your rake again and then pat it down until it's hard. 1. Pick through your onion sets and throw away the soft, small sets. The larger ones tend to grow better. 2. Map out a straight line in your soil patch with a string from one end to the other. Space these straight lines around 25 centimeters (10 inches) apart. 3. Take the end of your trowel and make 3 centimeter (1 inch) deep holes every 10 centimeters (4 inches) along your rows. 4. Place one onion set in each hole, ensuring that it is pointing upwards and that the onion's green shoot is a few millimeters above your soil. 5. Fill in your holes and soak them to set the soil. 1. Map out a straight line in your soil patch with a string from one end to the other. Space these straight lines around 25 centimeters (10 inches) apart. 2. Take the end of your trowel and make 3 centimeters (1 inch) deep holes every 10 centimeters (4 inches) along your rows. 3. Place an onion seed in each hole, ensuring that you'll be able to cover it completely with your soil. 4. Fill in your holes and soak them to set the soil. After you've done your planting, the next step is helping them grow. Wait for green shoots to develop after a few days if you planted onion sets. If you plant onion seeds, you won't see these green shoots for a week or two. This is the onion's germination period. When your onion has germinated, watch for their stalks to start growing up through the soil. Onions require a lot of water, but water them in the morning rather than the evening because you don't want to leave your onions wet overnight. Ideally, you want to soak your onions at least once a week to a depth of at least six inches. Onions have shallow roots, and this means that they can dry out faster than most vegetables. Watch out for weeds poking up through the soil as your onions grow. Weed your onion patch at least once a week. Use a hoe or weed by hand around your onions to keep the soil weed free. Harvest in late August to early October. Wait for your onion stems to start to transition from their green color to brown. Your onions should be very large at this point. Bend your onion stems over slightly a few days before you harvest them because this will ensure that your onions start to dry out. A few days after you've bent your brown onion stems, it's time to start harvesting them. Gently loosen the soil directly around your red onion. You can do this by hand or with a trowel. Next, gently pull your red onion out of the soil and clean off any excess dirt. Store your onion in a shed or a cool, dry place for a few days to allow your harvest to develop its flavors further. One of the most common fungi that can destroy your onions is Downy Mildew. This appears if your onion stems stay wet constantly. If infected, your stems will turn grey and show a fuzzy growth. Cut away the affected areas to save your onions. Botrytis allii is the fungus that causes this common problem. Watch for a fuzzy, grey fungus to grow on your onion's head. The next stage is the onion's head rotting and turning black. To avoid this, rotate your onion crops each year and plant them in different places. The sulfuric compounds present in this vegetable are responsible for making us tear up when we're cutting into an onion. Libya has the highest per pound onion consumption in the world with 66.8 pounds consumed each year. A single serving contains 45 calories. There are over 125,000 acres of onions planted in the United States each year. Brandon from Brandon & Meredith put together a comprehensive and easy-to-understand video on how to plant, grow, and harvest onions from start to finish. This is a good supplement to watch after reading this article.